What is rising damp in a house? Rising damp is an issue that has the potential to affect any building. It is a particular problem in older houses where the original damp proof course that was installed to prevent rising damp has become damaged or where the ground level around a property has been raised bridging the original damp proof course with the possible addition of a new path, drive way, flower bed, etc. 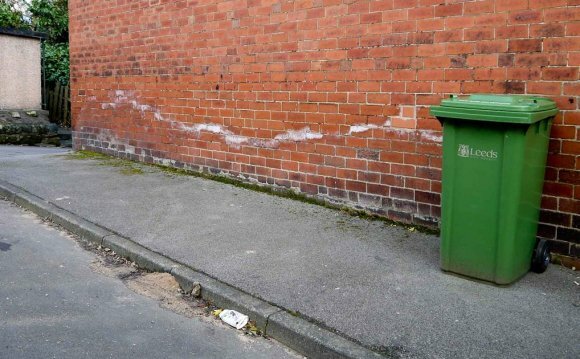 Over time, a failed barrier to prevent rising damp will allow water from the ground to rise through the brick work, stone work or through the mortar joint that holds the brick work together. This ground water often contains soluble salts that are deposited on the surfaces of the walls as they dry out. In turn, these salts draw moisture from the atmosphere giving a permanent damp feeling to the wall leading to one of the key indicators to help identify rising damp. All buildings are surrounded by natural moisture that unless prevented is trying to get into the structure of the building. Materials such as stone and brick are naturally porous and will gradually soak up moisture via their capillaries. When a building is constructed, a measure to prevent rising damp is generally installed in the form of a physical (lead lined bituminous or other membranes, slate, blue brick) damp proof course into the walls however, when this preventative rising damp treatment does not exist or becomes damaged the most common result is rising damp. Rising damp is unsightly, potentially unhealthy, often leads to timber decay and can cause heat loss due to the increased conductivity of the walls. If you notice the tell tale signs of rising damp a general rule of thumb is that the sooner you start thinking about resolving the issue, the less likely for more damage to occur and the lower the potential costs to remedy the issue. Often, the easiest and most reliable way to do this is to contact an experienced and qualified rising damp specialist such as ourselves that are familiar with rising damp problems and the variety of rising damp treatments available. Not sure what to look out for with rising damp? Check out our handy tell tale guide to identifying a rising damp issue. Don't just listen to us regarding rising damp. Find out what the governing body of the damp industry has to say. Identifying a rising damp issue can usually be done by looking for visual clues and by touch. Tell tale signs of rising damp include a "tide-mark" on the wall above skirting boards of up to 1 metre, peeling wallpaper and possibly white efflorescent salts which have been drawn out of the brickwork by the water. To help you identify the issue or for more information on how to spot rising damp, visit our web page on the tell tale signs of rising damp. Firstly, consider if the rising damp (damp proofing) barrier is really to blame. Sometimes new external features such as a flowerbed or patio may have been installed above the rising damp barrier causing rising damp to occur. By lowering these features to below the damp barrier you may cure a rising damp problem by allowing the area to dry out naturally. After that, all you really need to do is to regually open your windows and heat the room. However, if the rising damp barrier has failed, modern techniques employed by rising damp specialists are very successful and a rising damp survey will reveal the extent of any problem with the recommended and most appropriate rising damp treatment. This could either be the injection of water repellent chemicals into the brick work or the fitting of a new physical damp proof membrane to the area with the removal and replacement of any affected plaster work and damaged timber. Want to learn more on how to treat rising damp? Check out our guide on rising damp treatments and solutions.